Gov.-elect Mike Dunleavy today announced a key member of his cabinet: Corri Feige will be Alaska’s next natural resources commissioner. Dunleavy made the announcement at an industry conference in Anchorage. “We’ve had great conversations with her; very intelligent, very knowledgeable, pretty much in line with where we want to go as a state, and that’s creating jobs, creating opportunities,” Dunleavy told reporters after the announcement. Feige is not new to the agency she will now lead. 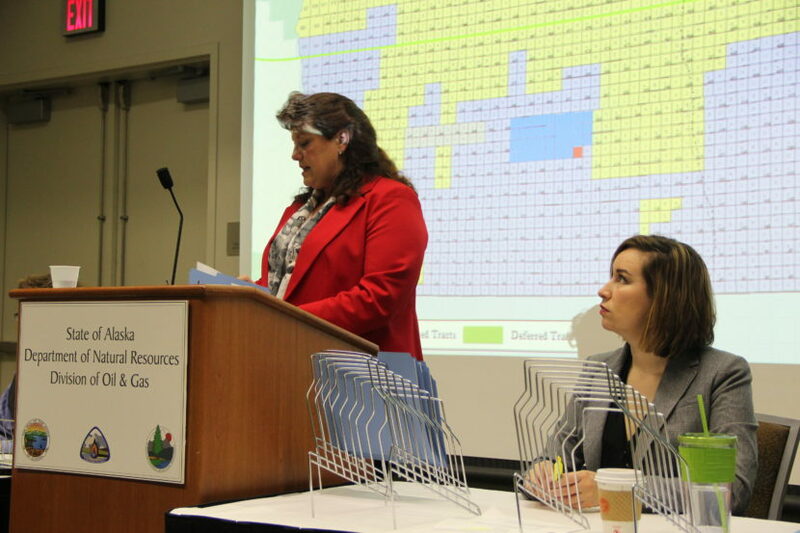 She was previously the head of the Alaska Department of Natural Resources’ Division of Oil and Gas under Gov. Bill Walker. But she resigned in 2016 during a dispute between the Walker administration and oil companies over marketing North Slope gas. Feige is a geophysicist and engineer by training and has previously worked for smaller independent oil and mining companies in Alaska. She is married to Eric Feige, a former Republican state representative. In her new role, Feige will help steer the Dunleavy administration’s policies on issues including the natural gas pipeline project and the proposed Pebble Mine. Feige will also be a central voice in Alaska’s relationship with the Trump administration as it pushes for more oil development on the state’s federal lands and waters, including in the Arctic National Wildlife Refuge. The governor-elect also made a policy announcement: Dunleavy said he wants to freeze all new regulations across all state departments and will attempt to retroactively freeze any regulations put forth by the Walker administration after Election Day. In response, Austin Baird, a spokesman for Gov. Walker, said he didn’t believe this would result in any significant changes, as “there is no plan to implement new regulations that would restrict resource development in any way,” Baird said in an email. “The Governor-elect is effectively asking the Walker Administration to continue the work we’ve been doing for the past four years,” Baird said.